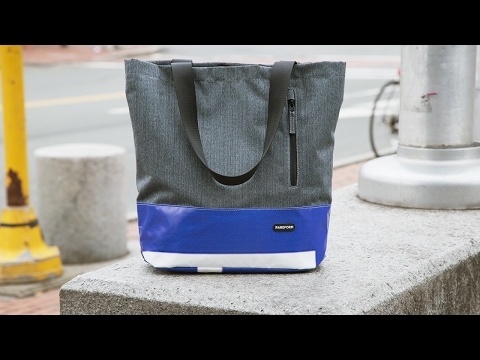 This upcycled duffle draws attention and stands up to the elements. Every single model is unique. RAREFORM gives freeway billboards new life, hand-cutting the vinyl and repurposing it into a bold, durable, eco-friendly bag. 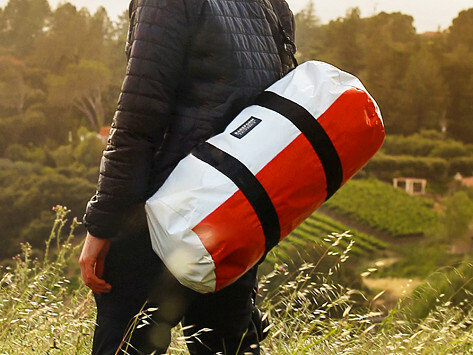 This all-terrain duffle was built to last and travel with you. Living in the land of billboards, this duffle was fun and made me proud to know that creativity can help us surpass simplicity with sublime! I'm very pleased that these bags are made from a recycled material, it's one small thing that I can control in my world! The quality is excellent,llent, very well made, and the bag could take a beating though I'm pretty gentle with my stuff. Also very lightweight! The duffle bag is actually bigger than I thought it would be, that's fine with me, also bought the backpack. I bought the bags mainly for emergency supplies, and wanted something waterproof, and they are. These are good looking bags, I ordered the blue/white, they may get used for weekend travel also. Also a note for the designer, I considered the tote for my purse and other items such as computer, and travel items, but I prefer bags with a zipper closure for security.